Age of Conan and Anarchy Online may not be getting any development love any more, but that doesn’t mean you can’t buy Funcom Points and use them in those games. 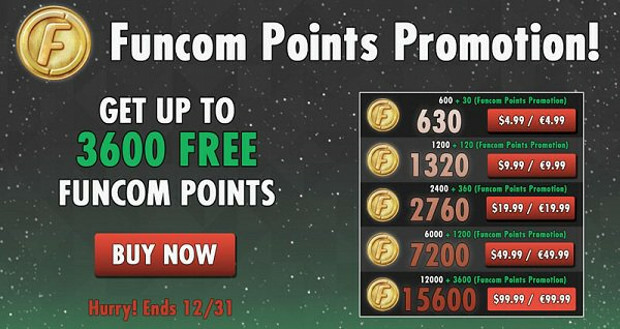 In fact, just in time for the holidays, the developer has decided to offer a sale on Funcom points. Or perhaps they’re just offering a sale on Funcom points in general and decided to share the love across all their games. Don’t miss out on Holiday Offers! Get extra Funcom Points for FREE with purchase, or extra goodies for Membership! If you’re into either of these games it might be worth throwing down a few bucks. On the other hand, if you’re really into Anarchy Online, you can pay for a membership and get access to a bunch of content you otherwise wouldn’t have — plus, loyalty rewards every 30 days.